distribution Limited in NC to the Sandhills and adjacent southern Coastal Plain near the SC border. NC lies at the northern edge of the species' range. abundance Uncommon in the Sandhills; less numerous -- presumably rare to uncommon -- in the adjacent Coastal Plain (Robeson, Bladen, and Columbus counties) to the southeast. Surprisingly, all daily counts are just of one to two individuals. flight Summer into early fall. Records occur between mid-June and mid-October; however, most are from late July to late September. habitat Breeds in rather acidic waters of seeps, springs, small streams, etc., mainly in or near forested habitats. Presumably uses pocosin streamheads in the Sandhills. behavior Can be seen flying along roads, trails, or brushy areas near wetlands. Perches frequently, both on the ground and on vegetation. comments This is one of the Sandhills' most spectacular odonates. Adults are large, and the bright rusty-orange club easily draws attention. 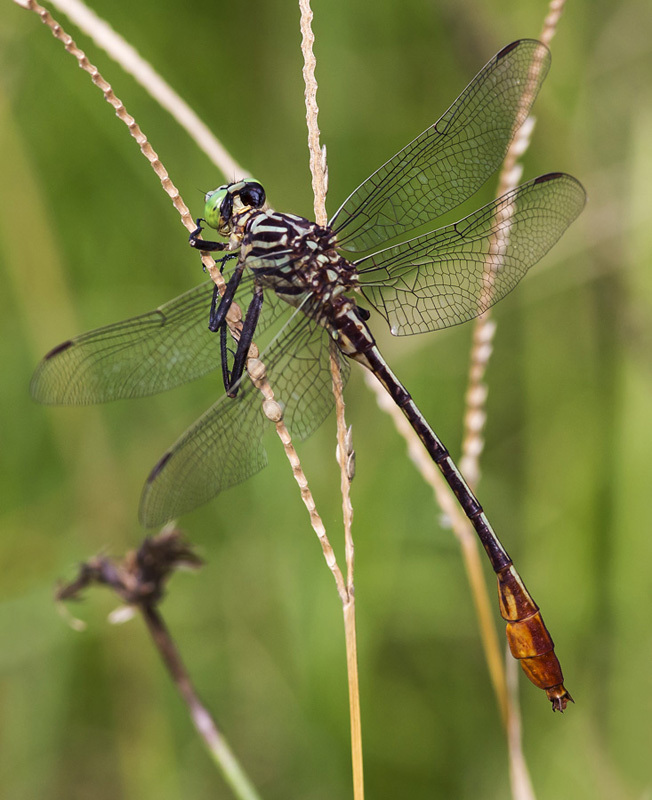 Though a handful of other clubtails flying at that season have rusty-orange clubs (such as Russet-tipped Clubtail and Two-striped Forceptail), they typically are restricted to water and seldom perch on sand roads and other places well away from water.